Levi's® has partnered with food activist Alice Waters and friends to celebrate 40-years of the 'Delicious Revolution'. Since 1971, Alice and her restaurant Chez Panisse have brought together farmers, producers, chefs, educators, journalists, politicians, and artists in an effort to transform the American food landscape and promote a healthy, sustainable future. 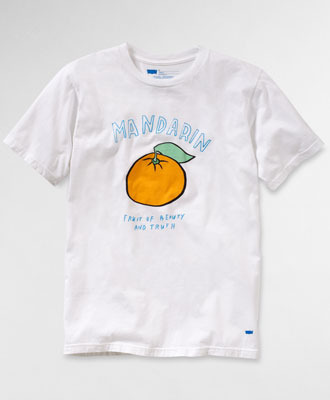 Proceeds from the sale of these 100% organic cotton t-shirts help support the Edible Schoolyard, a national organization that integrates garden and kitchen education into grade-school curriculum. Aside from being a pretty cool project, and my love for mandarin's in general - this specific collaboration hit close to home. Why you ask? Because Dave Eggers wrote the 1 book that I started and failed to finish - A Heartbreaking Work of Staggering Genius. I read a lot - and whether I love a book or despise it, and regardless of how long it takes - I finish it.. I can't even recall what it is about this book that prevented me to finish it - the Cancer portion hitting too close to home? The fact that it was so highly rated by the critics? The inherent sadness? - I don't know, but I'm tempted to pick it up and power threw off GP. Anyway - I digress. Purchase the shirt here.